Microsoft has updated its support notice to say that Windows computers will not receive any security updates at all until their AV software is certified compatible with the Spectre and Meltdown patches. Windows PCs running anti-virus software that is incompatible with the recent Meltdown and Spectre patches will no longer receive any security updates, Microsoft has warned. Spectre and Meltdown are design flaws in modern processors that could allow hackers to bypass system protections on a wide range of devices, allowing attackers to read sensitive information, such as passwords, from memory. Microsoft has rolled out a series of patches for the flaws since January 3rd, but last week said these patches would not be pushed to computers running incompatible third-party AV. Now Microsoft has updated its support notice to say that Windows computers will not receive any security updates at all until their AV software is certified compatible with the Spectre and Meltdown patches. Windows systems will not be certified as compatible until the AV vendor sets a specific key in the Windows registry. “Customers will not receive the January 2018 security updates (or any subsequent security updates) and will not be protected from security vulnerabilities unless their antivirus software vendor sets the following registry key,” says Microsoft. Security researcher Kevin Beaumont has put together a list of antivirus products that are compatible with Microsoft’s Spectre and Meltdown updates, and which have set the Windows registry key. Compatible anti-virus products include those from Avast, AVG, Avira, Bitdefender, ESET, F-Secure, Kaspersky, Malwarebytes, Sophos, and Symantec. Systems running McAfee, TrendMicro, and Webroot software are also expected to be eligible to receive the updates soon. Various other security providers, including CrowdStrike, Cylance, FireEye and Palo Alto Networks, have not yet set the registry key, but claim their products are compatible. Beaumont says that companies whose AV products are designed to be used alongside other security software say they are loathe to set the key, in case other software on the system clashes with the fix. System admins can manually set the registry key, however, Microsoft warns that doing so may cause serious problems that “require you to reinstall your operating system”. To manually update the registry, follow this guide. Was it m@nk3yP@$$w01rd or m0nk3yp@ssw0!rd? For 20 years, the standard advice for creating a “strong” password that is hard to crack has been to use a mix of letters, numbers and symbols. It’s so ingrained that when you go to create a new email account you’ll frequently get praising or finger-wagging feedback from the computer on how well your secret code adheres to these guidelines. And you’re supposed to change it every 90 days. “Much of what I did I now regret,” Bill Burr, a 72-year-old retired former manager at the National Institute of Standards and Technology told the Wall Street Journal. The result is that people create odd-looking passwords and then have to write them down, which is of course less secure than something you can memorize. Users also lean on common substitutions, like “zeroes” for the letter O, which a smart hacker could program their password cracker to look for. Or they pick one “base” password that they can memorize and only change a single number. That’s also not as safe. The new password guidelines are both easier to remember, and harder to guess. The NIST’s revised tips say users should pick a string of simple English words — and only be forced to change them if there’s been evidence of a security break-in. Not only did the old password format frustrate users, it wasn’t even the best way to keep hackers at bay. For instance, “Tr0ub4dor&3” could take just three days to crack, according to one viral comic whose assertions have been verified by security researchers, while “CorrectHorseBatteryStaple” could take 550 years. This utility, which has the most comprehensive knowledge of auto-starting locations of any startup monitor, shows you what programs are configured to run during system bootup or login, and when you start various built-in Windows applications like Internet Explorer, Explorer and media players. These programs and drivers include ones in your startup folder, Run, RunOnce, and other Registry keys. Autoruns reports Explorer shell extensions, toolbars, browser helper objects, Winlogon notifications, auto-start services, and much more. Autoruns goes way beyond other autostart utilities. Autoruns‘ Hide Signed Microsoft Entries option helps you to zoom in on third-party auto-starting images that have been added to your system and it has support for looking at the auto-starting images configured for other accounts configured on a system. Also included in the download package is a command-line equivalent that can output in CSV format, Autorunsc. You’ll probably be surprised at how many executables are launched automatically! Simply run Autoruns and it shows you the currently configured auto-start applications as well as the full list of Registry and file system locations available for auto-start configuration. Autostart locations displayed by Autoruns include logon entries, Explorer add-ons, Internet Explorer add-ons including Browser Helper Objects (BHOs), Appinit DLLs, image hijacks, boot execute images, Winlogon notification DLLs, Windows Services and Winsock Layered Service Providers, media codecs, and more. Switch tabs to view autostarts from different categories. To view the properties of an executable configured to run automatically, select it and use the Properties menu item or toolbar button. If Process Explorer is running and there is an active process executing the selected executable then the Process Explorer menu item in the Entry menu will open the process properties dialog box for the process executing the selected image. Navigate to the Registry or file system location displayed or the configuration of an auto-start item by selecting the item and using the Jump to Entry menu item or toolbar button, and navigate to the location of an autostart image. To disable an auto-start entry uncheck its check box. To delete an auto-start configuration entry use the Delete menu item or toolbar button. The Options menu includes several display filtering options, such as only showing non-Windows entries, as well as access to a scan options dialog from where you can enable signature verification and Virus Total hash and file submission. Select entries in the User menu to view auto-starting images for different user accounts. More information on display options and additional information is available in the on-line help. l Logon startups (this is the default). n Winsock protocol and network providers. s Autostart services and non-disabled drivers. -c Print output as tab-delimited values. -m Hide Microsoft entries (signed entries if used with -v). -t Show timestamps in normalized UTC (YYYYMMDD-hhmmss). -u If VirusTotal check is enabled, show files that are unknown by VirusTotal or have non-zero detection, otherwise show only unsigned files. -x Print output as XML. -v[rs] Query VirusTotal (www.virustotal.com) for malware based on file hash. Add ‘r’ to open reports for files with non-zero detection. Files reported as not previously scanned will be uploaded to VirusTotal if the ‘s’ option is specified. Note scan results may not be available for five or more minutes. -vt Before using VirusTotal features, you must accept VirusTotal terms of service. See: https://www.virustotal.com/en/about/terms-of-service/ If you haven’t accepted the terms and you omit this option, you will be interactively prompted. -z Specifies the offline Windows system to scan. user Specifies the name of the user account for which autorun items will be shown. Specify ‘*’ to scan all user profiles. On the popular Discovery Channel program “Mythbusters,” hosts Adam Savage and Jamie Hyneman take a legend and deconstruct it to see whether its long-held beliefs are legitimate. They’ve busted all kinds of myths, from Jimmy Hoffa being buried under Giants Stadium (not true) to the ability to kill someone without a trace using an ice bullet (the bullet vaporizes as soon as the trigger’s pulled). One tall tale they haven’t tackled is that Macs are impervious to malware, so you needn’t worry about cybersecurity solutions. Antivirus and anti-malware protection is for the PCs. We’re here to bust that myth. Out the gate we can tell you that it’s true, Macs don’t have the same problem with malware as PCs do. One of the main reasons: sheer numbers. Cybercriminals look at the market and see that the vast majority of folks are on PCs, so they concentrate their efforts on creating malware that will result in the largest return on investment. But the tide is turning. Macs are now responsible for 7.5 percent of global personal computer sales. In the U.S., Apple is one of the top three PC vendors, just behind HP and Dell. And as creative departments grow in corporate environments (from design and content to programming and testing), more and more businesses are adding larger numbers of Macs to their environments. The popularity of Macs leads to more cybercriminals wanting to write malicious code for OS X. Although still much lower than PCs, the number of threats targeting Apple operating systems has grown steadily, with a spike in Mac infections observed over the last 18 months. A recent study by Bit9 + Carbon Black found that the number of Mac OS X malware samples detected in 2015 was five times greater than in the previous five years combined. Apple security is fairly tight—OS X has a basic built-in anti-malware feature, and if the machine detects a malicious program, it gets added to the signature database. From that point on, that piece of malware can’t be opened on any Mac, unless the user has explicitly disabled security updates. But clearly some malware is getting through. Which forms? Other forms of malware have given Apple the slip, including Potentially Unwanted Programs (PUPs), Info stealers, Trojans, and even ransomware (KeRanger). While these forms of malware are less prevalent, they can still be quite dangerous. KeRanger was downloaded by around 6,500 people within the 12-hour period that it was available. Some of those users had their data completely destroyed. How are they getting through? The main way that adware and malware is getting through on Macs these days is through codesigned apps, using a certificate obtained from Apple. The certificate is either stolen or bought and simply treated as disposable, since it costs only $99. Apple can revoke these certificates if they see them being abused, and they do so quickly when they find a new signed malware. However, Apple doesn’t take a particularly hard stand against most adware, which can persist for a long time with the same certificate. In addition, video and audio streaming sites and piracy sites often dole out adware. Software download sites distribute installers containing adware that has been added without the permission of the developers. Worse, even some developers’ own sites are guilty of bundling adware. For example, the popular Filezilla FTP client installs adware even when downloaded directly from the official site, and the free version of Avast had (and may still have) an ad-injecting feature in its browser extension. What happens to your Mac after an infection? Adware is a serious hassle. Injected ads are intrusive and can contain offensive content. They can also slow down your computer’s performance and result in browser destabilization. Malicious ads can even direct you to tech support scams where you can be scammed out of your money or into installing other harmful software. But that’s not all, Bob! What else have you won? Info stealers can, obviously, steal your info. And in the case of ransomware, data can be totally destroyed with no shot of getting it back. Myth: Macs are impervious to malware. Fact: Macs, while less vulnerable than PCs, are assailable. Their security can be penetrated, especially by cybercriminals looking to deliver adware. With increases in Mac popularity making OS X more appealing for crooks, plus the already considerable onslaught of adware, it makes sense to install an anti-malware program for your Mac. It should catch what OS X misses and restore your Mac’s performance to the high caliber you expect. Now what other myths can we bust? Can tooth fillings really receive radio waves? Mac users worried about what could be the first full-fledged ransomware attack on Apple (AAPL)’s desktop operating system can take certain steps to protect themselves. First off, users should avoid downloading Transmission BitTorrent version 2.90, the file-sharing software that delivered the ransomware — a form of malware that encrypts certain files and data until users submit a bitcoin payment. Mac users can also make sure Apple’s own malware protection feature, XProtect, is enabled. That feature blocks known malicious software from being installed on the tech giant’s computers. The ransomware, dubbed KeRanger, was detected by security company Palo Alto Networks on March 4, specifically on computers with Transmission BitTorrent installed, Palo Alto said Sunday. In this instance, the ransomware authors asked victims to pay one bitcoin (or about $414 as of Monday) in exchange for their data. In an email to CNBC, an Apple spokesperson said the company has updated XProtect and pulled Transmission BitTorrent’s developer certificate, so that no one can install the infected app. The bad guys also ran into some technical problems after they launched their attack. It turns out that when antivirus software removes CryptoLocker from an infected computer, the victim can no longer pay the ransom and decrypt their files. To do that, they had to re-install the CryptoLocker malware, something that was not only weird, but cumbersome. By using the customer service site, victims can get a key that will unscramble their files without the need to re-infect their computers. Is this the new reality? Law enforcement and cyber security experts always advise victims of ransomware attacks not to pay the ransom. After all, that extortion money goes to fund a criminal operation, and there’s no guarantee the files will be released. But when you’re the victim, when all of your data has been encrypted and you don’t have a suitable backup, you’re faced with two choices: pay up or have those files frozen forever. That’s why so many people are paying and why security experts fear more of this nasty malware is on the way. Sean Sullivan, security advisor at F-Secure, agrees. Until now, ransomware attacks have been limited by the lack of a global payment method. It took a lot of work to get paid in different parts of the world. Bitcoin, the new digital currency, solves that problem. The new CryptoBlocker delivery vehicle is a Zip file that requires a password to open. This is designed to fool antivirus software that can now detect the malware hidden in a regular zip file. Open that file and your files are toast. There are various ways for malware to infect your computer. 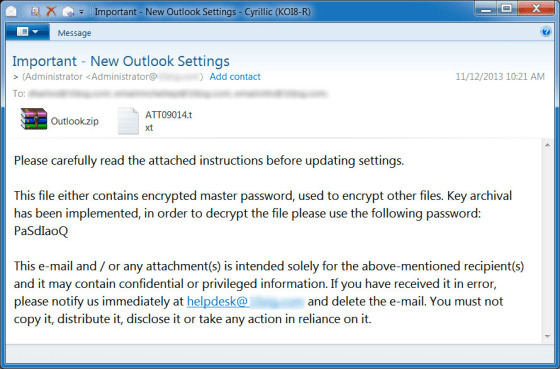 Security experts tell me CryptoLocker is delivered in a Zip file attachment. Open that attachment and the malware is loaded onto your machine. Some antivirus software can now detect CryptoLocker hidden in a Zip file and prevent the infection. So, a couple of days ago, the bad guys modified their attack. According to Lawrence Abrams at Bleeping Computer, the Zip files containing CryptoLocker are now password protected. That little trick gets them past the security software. Abrams said it appears the password “PaSdIaoQ” is the same for everyone. Open that attachment and your files are toast. It’s the same advice you’re heard before: Don’t open attachments from an unknown sender, have up-to-date security software and back-up your files religiously. And because CryptoLocker can compromise files already backed-up, you need to reassess how you do your backups. Network drives (whether physical or in the cloud) that are always connected to your computer are often vulnerable. Krebs suggests doing a manual backup and then disconnecting the drive when you’re done. It’s a lot more work, but much safer. Krebs warns that we are now dealing with a new generation of malware. Once it’s done its damage, you cannot undo it yourself. In a new article on his blog, Krebs recommends two tools that can block CryptoLocker infections: CryptoPrevent from Foolish IT for individual windows users and the CryptoLocker Prevention Kit from Third Tier for small business administrators. Should you ever get a phone call or email message offering to fix your computer by remote control (where they will log into your computer) don’t do it! This is a scam! Particularly if they say they are calling from Microsoft. I assure you they are not!